Britain is committed to free trade with Kenya and supports the East African nation by providing military equipment to enhance borderline aviation security, capacity building and information sharing, British Prime Minister Theresa May said on Thursday. 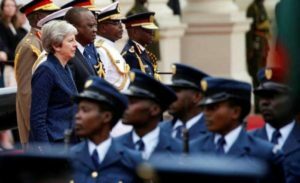 May who was speaking in Nairobi on the third stop of a trip to Africa, said, as Britain prepares to leave the European Union, “we are committed to a smooth transition that ensures continuity in our trading relationship with Kenya”. Britain will ensure that Kenya retains its duty-free quota-free access to the UK market, she said. The British PM also praised President Uhuru Kenyatta’s commitment to political reconciliation saying she will fully support the objectives of the handshake he reached with Opposition leader Raila Odinga. Nairobi and London have also reached a deal on Thursday to return cash stolen in Kenya and stashed in British banks. President Kenyatta said the deal is part of the renewed fight against corruption. He said Kenya is seeking a mutual win-win arrangement within the Commonwealth. Other agreements reached during their bilateral talks included cooperation on national and regional security. There was a specific emphasis on fighting al Shabaab terrorists. The President welcomed British investors to take advantage of Kenya’s Big Four Agenda, saying, “any investments here are guaranteed to benefit both the investors and ourselves”. Posted by Steven Addamah on August 31, 2018. Filed under News. You can follow any responses to this entry through the RSS 2.0. Both comments and pings are currently closed.